Looking at the Midland Hotel on your left, and St Peters Square in the distance. 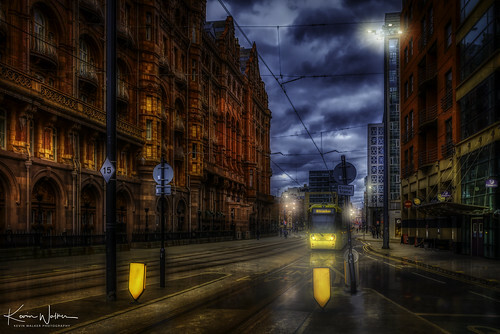 Mosley Street is a street in Manchester, England. It runs between its junction with Piccadilly Gardens and Market Street to St Peter's Square. Beyond St Peter's Square it becomes Lower Mosley Street. It is the location of several Grade II and Grade II* listed buildings. Mosley Street Metrolink station was located near Piccadilly Gardens. In 2009, the tram lines were reconstructed, and buses used Mosley Street en route to Piccadilly Gardens until May 2011, when they were rerouted along Portland Street. The street is now exclusively used by Metrolink trams and no cars are permitted on the street. The tram stop closed on 17 May 2013.